The interview happened at Tindallia Soothsayer's place. Her residence is gorgeous and well-designed. I gave Tindallia a compliment about her building skill. "Thank you, did my best with limited prims," she answered. We started talking about Tindallia's legend as a racer. As it turned out, in her first days there she was just going to the races as an observer because she enjoyed watching. "One day when there was no race, I tried to run the track, did pretty well." said Tindallia. "So decided to actually enter a race." Tindallia said that just by watching, she did learn how to race. "Well, more observant I'd say, just paid attention to what the other racers did and tried to do that myself," said Tindallia. She had been racing since November 2009. Tindallia had just announced her semi-retirement in January 2017. Tindallia had been dominating the races in the first place for years, during the seasons and in the championship. She had done things no other racer has done, such as getting a perfect score for the year. Tindallia had been getting 1st in every season, not only once but twice. Tindallia does a lot more than just race. She comes up with the theme for every week. 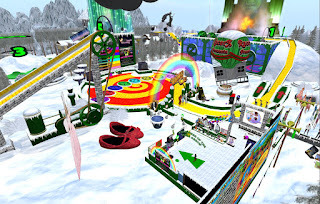 Tindallia also tear down the previous week's theme and decorate the track for the current theme. She build a themed snail for the race as well. Tindallia also co-host the show. She made awards, such as racing cup and the blue ribbons for the best in show. "Of course, just because I'm not racing doesn't mean I'm giving up the rest." said Tindallia. "I 'retired' because as I said, I've dominated the races for years. I felt it was time someone else had a chance at the 1st place position. Well, I've proven I can race, that's for sure. In my time racing I've gotten 673 trophies, blue ribbons and awards, I don't really need more." After 8 years, Tindallia still enjoy doing it. "It is the longest running event in SL. RacerX started doing races in 2004," said Tindallia. Tindallia announced her retirement just after 2:16 in this recording of the January 7 race.